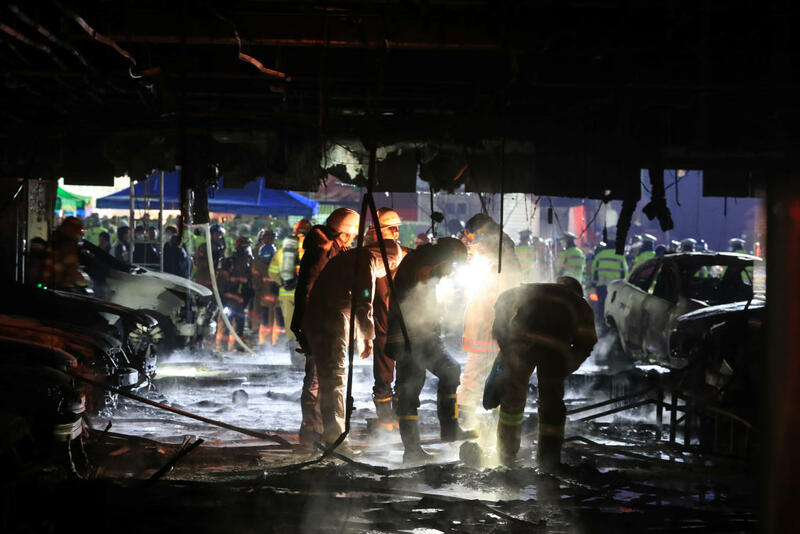 SEOUL: At least 29 people were killed and 26 injured Thursday in a major blaze at a fitness center building in the South Korean city of Jecheon, officials said, in one of the country’s deadliest fire disasters. The fire broke out around 4:00pm local time (0700 GMT) and quickly engulfed the entire eight-story building, leaving many trapped inside. Twenty victims were found at a public sauna and others elsewhere in the building that houses a fitness center, public bath and restaurants, the National Fire Agency said. “The fire produced so much toxic smoke so quickly, leaving many people unable to evacuate,” an agency spokesman said. Many victims appeared to been unaware of the fire raging outside the bathhouse until it became impossible to flee, he added. The death toll may rise further as firefighters continue to search the building, the spokesman said. Television footage showed the building consumed by orange flames and issuing dark plumes of smoke, as several people stood waiting to be rescued from an outdoor terrace. Some were seen jumping from the building onto air mattresses laid out on the ground as dozens of fire trucks and more than 100 firefighters rushed to the scene. The blaze — believed to have started in a parking lot on the first floor — has been mostly put out, the fire agency said. Jecheon is in central South Korea, about 120 kilometers (75 miles) southeast of the capital Seoul. The disaster forced organizers of the 2018 Pyeongchang Winter Olympics to cancel a planned torch relay event at the city on Friday, Yonhap news agency said, citing the organizers. “We decided to cancel the event to mourn the victims,” an unnamed official at the organizing committee was quoted as saying. The fire is South Korea’s worst since 2008 when a blaze at a warehouse in the city of Icheon killed 40 workers. President Moon Jae-In expressed regret over the accident and urged officials to make “utmost efforts” for rescue and search operations, his office said. The worst fire ever to hit modern South Korea was an arson attack on a subway station in the southeastern city of Daegu that left 192 people dead and nearly 150 injured in 2003.
be very risky. The operations provided by this site may become operations with high level of risk, and their execution can be very risky. In case of purchase of financial instruments offered by the Website and the Services, you may incur significant losses of investment or even lose all funds on your Account. You are granted limited non-exclusive rights to use the IP contained in this site for personal, non-commercial, non-transferable use only in relation to the services offered on the site.